Depression accounts for the largest burden of mental illness worldwide, with a global prevalence of 4·7% and an associated cost of US$1·15 trillion. Although psychological treatments are recommended as first-line interventions, most depressed people living in poor countries lack access to such treatments. This trial done in India is the first study to assess the effectiveness and cost-effectiveness of psychological treatment for depression in a lower middle-income country, showing acceptability, feasibility, and cost-effectiveness when delivered by lay health-workers and advancing knowledge on SDG 3. The International Society of Paediatric Oncology (SIOP) and Childhood Cancer International (CCI) held a symposium at the 48th SIOP Congress in Dublin, Ireland, on Oct 19, 2016, entitled “Essential medicines for children with cancer: dynamics and challenges”. This joint position statement summarises the symposium's key consensus findings to galvanise the international oncology community to achieve sustained improvements in access to medicines for children with cancer, regardless of disease or geography supporting tagerts 3.2 and 3.4. This paper details a Research Summit, which was convened in Nairobi, Kenya and aimed to: identify regional gaps in knowledge and priorities for nursing and midwifery research and mentorship, recommend strategies that address these gaps, develop a mentorship plan with access to a pool of regional and global nurse and midwifery research experts, and disseminate recommended strategies with a mentorship approach to pave the way for sustainability and replication. It helps support both SDG 3 and SDG 4, recognising the importance of quality education to develop and enhance the careers of nurses and midwives. 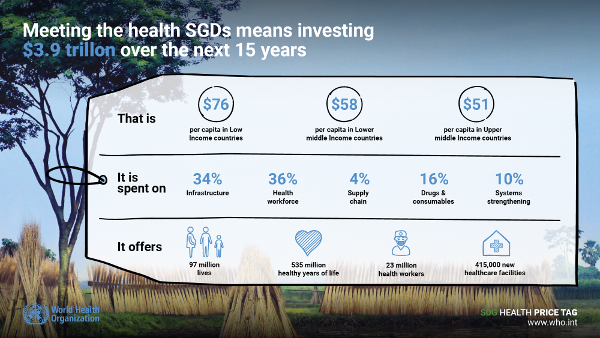 How much will it cost to reach the health-related SDGs in low-income and middle-income countries? This model-based projection analysis funded by the World Health Organization estimates that an extra $274 billion spending on health is needed per year by 2030 to make progress towards the SDG 3 targets—the equivalent of $58 per person. If actually spent, 97 million lives could be saved and life expectancy increased by 3·1–8·4 years. Kidney diseases (KDs), both acute and chronic, are recognized as major public health issues worldwide and important contributors to the rising burden of noncommunicable diseases (NCDs). More than half of patients with advanced chronic kidney disease (CKD) do not receive any treatment, especially in the low and low middle income countries (LMICs). Similarly, acute kidney injury (AKI) contributes to about 1.7 million preventable deaths every year worldwide. There is a critical requirement for the development of an implementation framework tailored to the local needs of health systems and to optimize the quality of care for patients at risk for developing KD in limited-resource settings. SDG 3.4 specifically addresses reduction of premature mortality from NCDs. Ending preventable deaths of children under 5 is a target of SDG 3. This article recognises that pneumonia deaths among children younger than 5 years old have declined between 2000 and 2015. Vaccine and antibiotic use have spurred this mortality reduction but maximum benefits will only be achieved with new interventions working synergistically with established approaches.